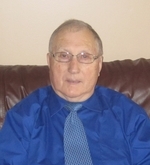 It is with sadness that the family of Ralph Henry Langdon announces his peaceful passing at the Connaigre Peninsula Health Care Centre in Harbour Breton on January 8, 2019 at the age of 84. Ralph was a long time resident of Harbour Breton and Seal Cove. He leaves with many fond memories, his loving wife of 62 years, Effie; sons, Levi Langdon (Anita) at St. John’s, NL and Boyde Langdon (Elizabeth) at Ellerhouse, NS; daughters, Gloria Ollerhead and Tracey Casey (Mike) all at Brooks, AB; brothers, John Langdon (Myrtle) at Foxtrap, NL. and Clayton Langdon (Gladys) at Seal Cove; sister, Ettie Piercey; grandchildren, Victoria, Kristy, McGill, Aaron, Sarah and Lucas; brother in law, Andrew Harris (Audrey); sisters in law, Geraldine Smith and Winnie Loveless (Carl); his two caregivers, Donna Wells and Brenda Wells; plus a circle of other relatives and friends. Ralph is predeceased by his parents, Lawrence and Gertie Langdon; parents in law, Robert and Ethel Harris; brothers in law, Claude Smith and Joseph Piercey. Visitation took place Wednesday, January 9, 2019, Thursday, January 10, 2019 and Friday morning, January 11, 2019 at the Salvation Army Church, Seal Cove. Celebration of Ralph’s life was held at the Salvation Army Church on Friday, January 11, 2019 at 2:00 pm with Aux. Captains Randy and Diane Kirby officiating. Interment followed at the Salvation Army Cemetery, Seal Cove.